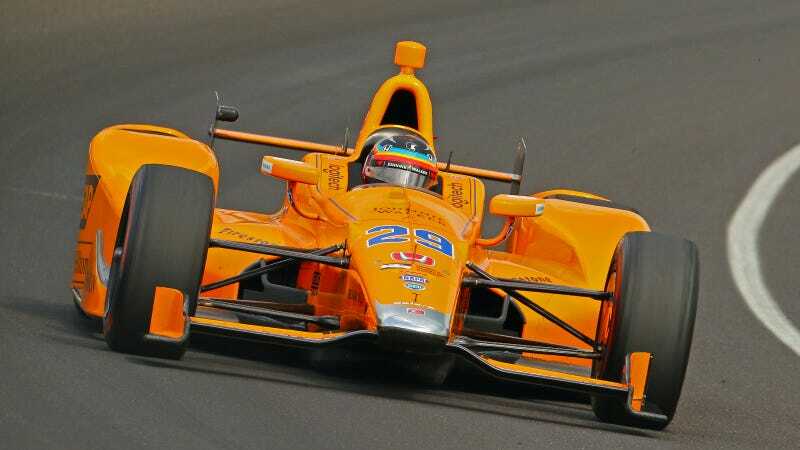 If you’re just now following the Indianapolis 500 thanks to the appearance of a two-time Formula One champ on the grid, the Indy 500's qualifying system may look completely foreign to you. But it’s okay! We’re here to help you figure it all out, and it’s not as hard to follow from home as it may appear. Qualifying for most IndyCar races is pretty simple, but this is the Indianapolis 500: a race steeped in its own traditions and unique ways of doing things. IndyCar racing completely takes over the month of May at Indianapolis Motor Speedway, so of course they’re going to spread Indy 500 qualifying out to two days and do things totally different than any other race on the calendar. Like any other IndyCar race, the starting order was chosen by blind draw last night, but from there it gets complicated. Cars had to be in line for technical inspection by 10:15 a.m. ET to ensure they’ll get at least one qualifying attempt, per IndyCar. After they’re through with tech inspection, teams can only adjust front and rear wing angles and tire pressures. Cars stay in line until qualifying with no further changes, too, else a team must give up their one guaranteed attempt at qualifying today. Each car gets two warmup laps to get up to speed and make sure all is well with the car. When ready, a team representative signals to the starter to wave a green flag to begin a driver’s four qualifying laps. The cumulative time of these four laps is what counts, so make it quick, will ya? You’ll hear commentators talk more about the average speed of those four laps, expressed in MPH. Cars are re-ordered based on the cumulative time of those four qualifying laps. Once all of the cars that were guaranteed a qualifying time have run their four laps, it’s open for anyone else to set a time (if they have not yet done so) or make a re-run if they think they can better their time from the Fast Lane. Cars that want a re-do from the Fast Lane forfeit their previous qualifying time to do so. Teams who were happy with their times can still make a second attempt without forfeiting their original time to do so starting from Lane 2, however, they have to wait until the entire Fast Lane has gotten a chance to run before making their next attempt. If they’re faster, that’s the time that counts, but if they’re slower, their previous time still stands. The nine cars with the fastest nine times on the board advance to Sunday’s main qualifying session: the Fast Nine Shootout, which determines the first three starting rows for the Indianapolis 500, which runs from 5:00 to 5:45 p.m. ET. All other cars that qualify in places 10-33 today go into the earlier Group 1 qualifying session (2:45-4:45 p.m. ET) for Sunday, which sets the order of the rest of the grid. Cars that can’t set a time today automatically go into Group 1 Qualifying tomorrow. Cars in both groups qualify in reverse order, from slowest to fastest, depending on how they qualified Saturday. The times are reset, with only Sunday’s four-lap aggregate time counting towards where they’ll start the race. The final race order is set from fastest to slowest based on Sunday’s times, as you would expect. Winning pole position among the Fast Nine doesn’t just mean you start from the front: the winner also gets a $100,000 prize. Trust me, it’s a lot simpler once you see it in action. The fastest times still get pole position, so there’s no tricks or crazy traditions like a milk juggling contest or a “Back Home Again In Indiana” sing-off at play there. Mind you, qualifying is the last time these cars run with an extra 1.5 bar of boost, so it’s a bit of an insane spectacle in its own right even if you’re not the biggest fan of single-car qualifying runs. These cars already exceeded 230 mph with the extra boost during Fast Friday! Qualifying broadcasts for both days kicks off at 4:00 p.m. ET on ABC. However, today’s wet weather may push that broadcast start back a bit, as it already rained out the earlier qualifying session for the day. [Update: it started on time after all.] Keep an eye on IndyCar’s Twitter account for updates as to whether it’s all dry and ready to go.